I've made two cards for this week's Featured Stamper challenge at Splitcoaststampers. The Featured Stamper is someone whose user name is Disaster. She must be one confident woman, I tell you. There is absolutely nothing disastrous about her gallery, but I found it strange to see the word 'Disaster' under each and every card she made. I couldn't do it (I guess I'm too suggestible! ), but it seems to have had no negative effect on her creativity! See? Very pretty, not a disaster at all! 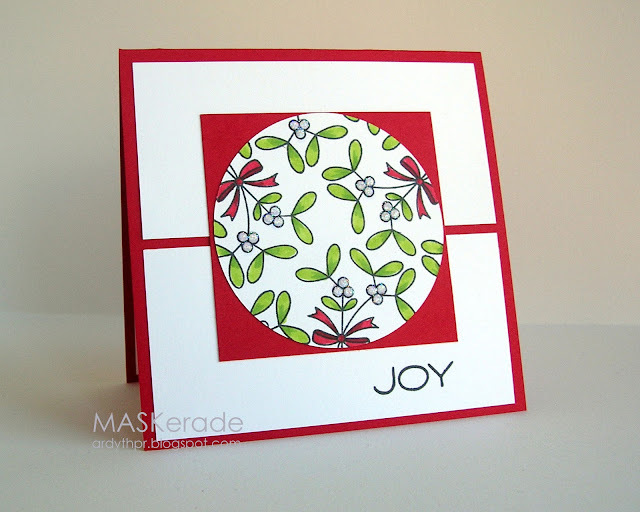 I used Papertrey's Tremendous Treats (Christmas) and Annabelle Stamps sentiment. This is a fun technique called "Burnished Velvet". You use strips of double sided tape and expose only the ones you want in that particular colour. I used Glitter Ritz micro glitter - it really feels like velvet once it's on the panel. Of course I sparkled for the rest of the day, but that's half the fun of crafting, right? I used the same mistletoe image, but in the smaller size and my favourite Stampabilities Merry Christmas (masked so I didn't get the second line of the sentiment). See you tomorrow for the next CASology Cue Card! Gorgeous cards...love the holly...it is stunning! Definitely NOT disasters - hers or yours!! I love the crisp look and simple colors of the first card. The second is so festive which is amazing given it's a few stripes and a sentiment!! All four cards are beautiful. Great coloring on the mistletoe - it reminds me of the balls of mistletoe that are hung in doorways. I totally agree with Kim on the second card - graphic AND festive! I agree definitely not disasters. I love both of your cards, but that first one just POPS right off the card. LOVE it. 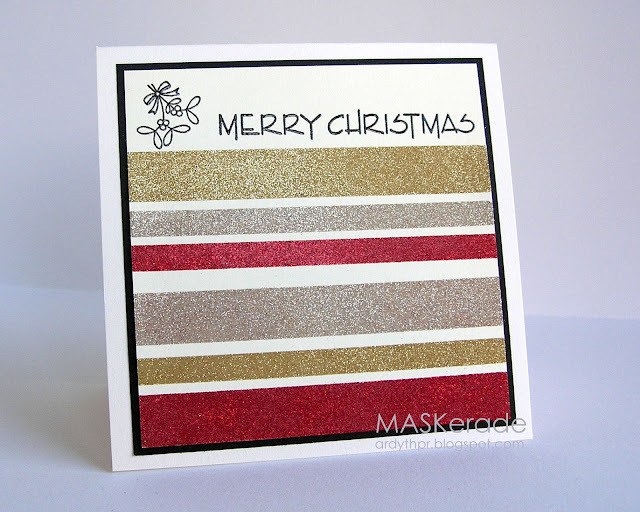 Love both of your cards Ardyth, I love the mistletoe image and the lovely glitter. Love that cheerful mistletoe card, Ardyth! I like how the red bows are towards the outside of the circle. And I love the burnished velvet card, I'm definitely trying that technique. Beautiful cards, both of them, Ardyth! I thought, "what the ..." when I saw the title of your post. I couldn't believe anything you made was a disaster and I was right!! You threw me for a loop there. LOVE each of these cards ... the coloring in the first one, and the technique and coloring in the second.